historic Granma region, on the southeastern sole of the island. horseshoe bay, cradled by the mighty Sierra Maestra Mountains. It’s a memorable place that has captured the hearts of many! Want to be part of a JennicaCuba Group? This is an opportunity for a down-to-earth travel experience in rural Cuba, as envisioned and arranged by Jenny Cressman, who has been a repeat guest at this resort since 2009. Keep in mind that, although you’ll booked with a group in order to get preferred rates, there is no obligation to do any “group stuff.” You can simply hang out on the beach if you wish! Or, you can participate in any or all of the options outlined in the information sheets entitled “JennicaCuba Projects” and “JennicaCuba Activities.” No matter what you choose to do (or not do), the goal is the same – relax, enjoy yourself and smile as much as possible! JennicaCuba offers group trips to Marea del Portillo twice a year. They are usually in April, after Easter, and in late October/early November; dates vary according to when the best prices are available. 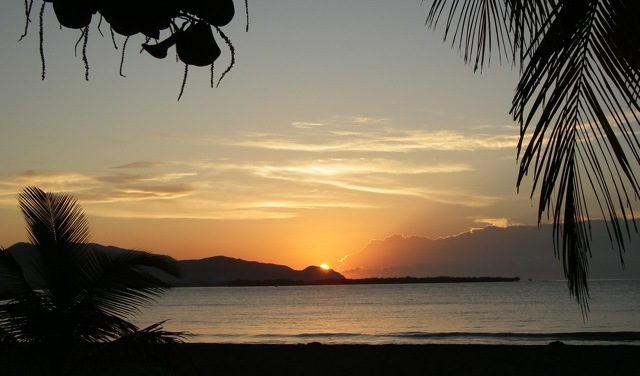 All groups are organized and led by Jenny and fly from Toronto’s Pearson Airport, via Sunwing, to Manzanillo de Cuba. This resort is part of Sunwing’s Club Amigo chain; they provide transportation to/from the airport in Cuba. Sunwing is the only airline that serves this location and, although they primarily fly out of Toronto, they do also offer flights from Montreal at certain times of the year. JennicaCuba can also assist you in organizing your own group! Do you have a special interest , activity or theme? Just call Jenny (647-216-1791) to discuss what you would like to do – her familiarity with this resort and the area will be an asset for planning and customizing your group's holiday. A minimum of 10 people is required for a group booking. 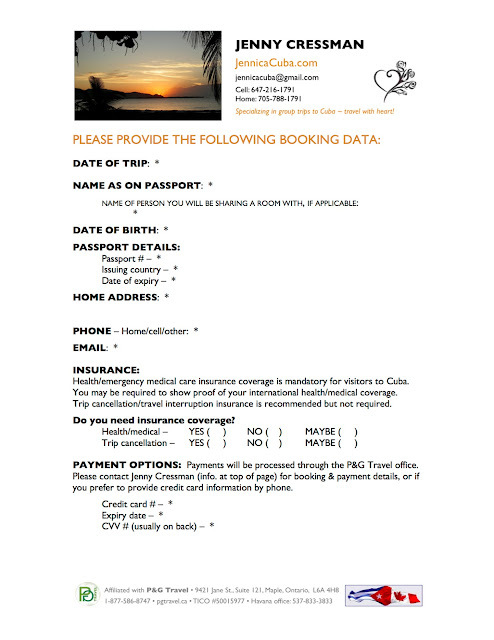 Health insurance is mandatory in Cuba for all foreign visitors. Although it is not routinely checked everywhere, you SHOULD have written proof of coverage with you when visiting the country. Rates are usually based on your age & the length of your stay. Jenny can assist you with insurance options.